Since I'm going on a little trip up north this May (a family birthday celebration in case you were somewhat curious), I thought why not round up a small fraction of the beauty products I'll be packing in my travel kit and share them with you all today. 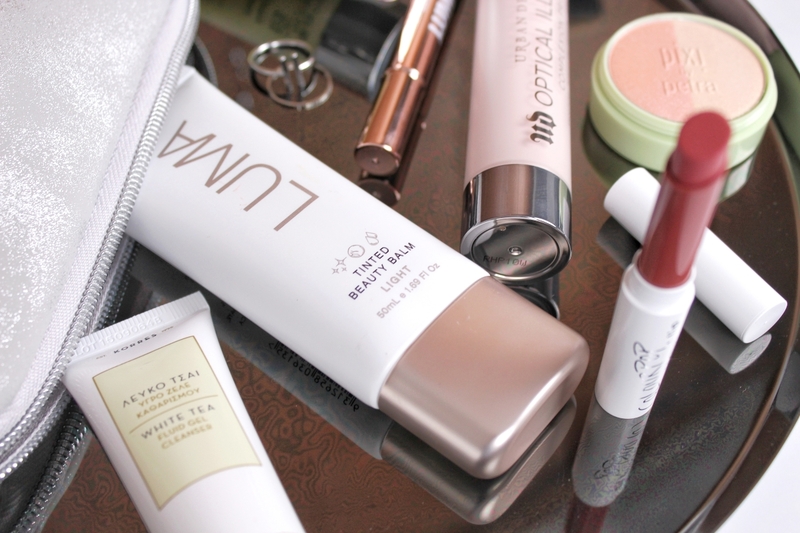 I had to refrain a tiny bit because sacrificing clothing space for beauty space probably isn't ideal, so here is a peek at the lucky winners that made it to my minimal travel beauty kit. I don't know how this does what it does but it's truly amazing! This makeup primer magically blurs, smooths and creates a soft-focus finish to my complexion for the most perfect base with the help of some lovely nourishing ingredients like argan, rosehip and vitamin e. My skin feels like actual velvet when applied and dries down to a complete matte finish which is what I always prefer. I already knew that I was going to choose this primer before I even began packing; it just ticks ALL the boxes for me! Very similar to YSL's Touche Éclat (but for a fraction of the price), this highlighting concealer pen works to brighten up the under eyes and add a touch of coverage all over for a natural "no makeup" look. I use this most days I wear makeup and I already have a back up on hand when I run out because THAT'S how much I love this thing! It takes up barely any space in my kit and it's so fuss-free so I can spend less time on makeup and more time enjoying my mini vacation. The thought of relying on face wipes to "cleanse" my skin on holiday makes me cringe, so there was no way I was going to leave without a facial cleanser to effectively rid that dirt and grime. I'm fairly certain I found this deluxe sample in a beauty subscription box so I gave it a go and it's an absolute pleasure to use! I'm already a lover of the brand and the fact that it contains 88% natural content definitely won me over as well as how clarified and hydrated my skin felt afterwards. As much as I like this, I'm still very loyal to my Soap & Glory Face Soap and Clarity Facial Wash which does a wonderful job and it's amazing value for money! 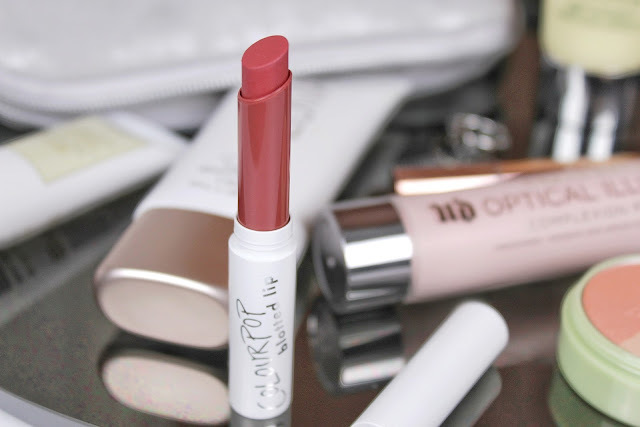 Sticking with the whole natural makeup theme of my travel makeup kit, 'Drip' from Colourpop's Blotted Lip range is the prettiest rosey mauve for a wash of colour to the lips. I like to dab it on and blend for a soft, diffused look and for a matte finish it's actually super comfortable without it feeling dry whatsoever. A definite favourite when I want to wear lipstick but I'm too lazy to go through the effort of a bold lip or having to touch up throughout the night. If you caught my latest brand focus (you can find it here in case you missed it), I featured this gorgeous beauty balm that leaves you with a radiant, glow from within complexion. After I've cleansed and moisturised, I'll follow up with this for a natural glowy finish to my skin and the great thing is it can be built up from sheer to medium depending on what you feel like on the day. It's infused with grape seed an pomegranate oils that give you a little hydration boost and I just LOVE how lightweight it feels! 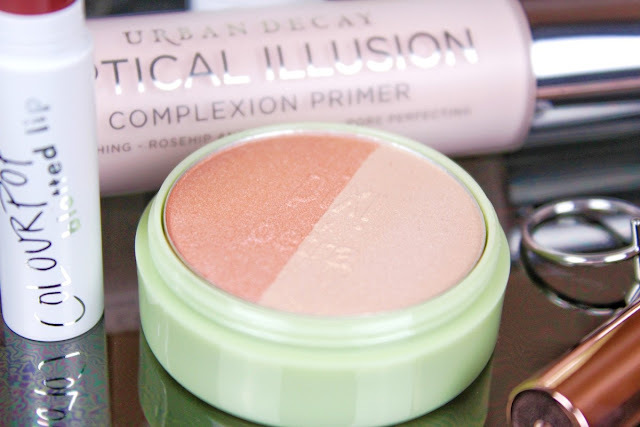 A really beautiful product for brightening and perfecting your complexion. It's safe to say this is my holy grail of face moisturisers. My skin just drinks this up and I'm always amazed at how soft and smooth my skin feels every time I use it. This is my all year round moisturiser because it hydrates so well during the cooler months, but it's also oil-free so it isn't heavy or greasy in the slightest during the hot and sweaty months. It honestly is a dramatic difference and I highly recommend including this in your regimen if you have combination or oily skin - your skin will love you for it! 'Peach Honey' gives my cheeks a soft peach-pink golden hue with a strobe-like finish that looks oh so natural. You can swirl your brush in both shades or you can dip into each shade separately and pinpoint where you'd like to apply it. The highlighter looks stunning on the cheekbones and it really enhances your radiance, especially when used in conjunction with the Luma Beauty Balm! It's a super adorable 2-in-1 product and it I love how flattering it looks on the skin when the light catches it.